Grid shape – rectangular – provides a visual regularity that helps you clearly see the information hidden in the population distribution patterns. The distortion resulting from irregularly shaped features such as tracts and zip codes is avoided with microgrids. 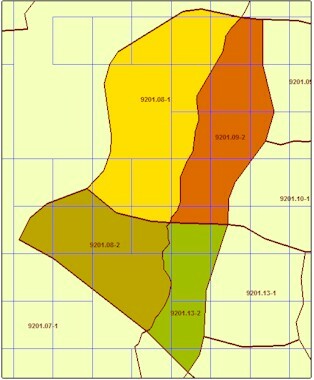 Grid Size – small, medium and large – give you an immediate estimation of the population density. Generally, the small 1/16 mile grids represent the densest urban areas. The medium grids, 1/4 mile square, indicate small metro areas or isolated communities. The large 1 mile square grid suggests rural or non-urban areas with low population density. Absence of Grids – indicates the absence of residential population or commercial activity. These grid-less areas could represent open wilderness areas, parks or airports, etc. The MicroGrid is a revolutionary geography, developed by Scan/US, that displays demographic characteristics of an area down to 1/16 of a square mile. When compared to Census block group geography, Microgrids are finer grained and also provide greater clarity because the grids only exist where there is housing and business activity. Currently, the Scan/US MicroGrid cartography contains 2.55 million grids, a resolution that is 12 times that of block group cartography! You will find grids of three sizes where there is any residential or commercial activity. A minute grid approximates 1 square mile, a 1/4 minute grid approximates .25 square mile and a 1/16 minute grid approximates .0625 square mile. The density of development determines the size of the grid: the denser the development the smaller the grid. Where there is no development there are no grids. Unlike demographics by zip code or block group, MicroGrid technology generates more accurate demographic information allowing you to make a better informed choice in the site selection process. Notice how much more detailed the microgrids (shown in blue) are compared to the block groups. The absense of microgrids also shows where there is open space (no residents or businesses). The MicroGrid cartography is updated annually. The key ingredients in this process are a current national mailing list of deliverable residential and business addresses summarized to ZIP+4s, and latitude/longitude coordinates for each ZIP+4. The 40 million or so ZIP+4s, with their current residential and business deliveries, are poured into the existing MicroGrid network, resulting in the addition of grids in new developing areas, or the subdivision of larger grids to better define the housing distribution in growing neighborhoods. The end results are a MicroGrid cartography that represents the current distribution of households and businesses throughout the United States down to 1/16th of a square mile.